I am so excited to announce that Dr.Brené Brown has a new book coming out and she sent them to all of her certified facilitators before it is released in August! Rising Strong: The Reckoning, The Rumble. The Revolution. 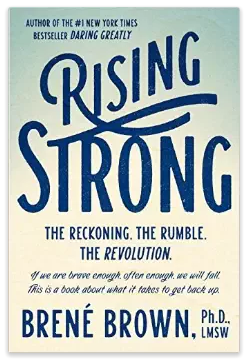 Rising Strong is about what Dr. Brené has learned about surviving hurt that actually saved her again and again. It saved her and in the process it CHANGED her! Daring Greatly: Be All In. Rising Strong: Fall, Get up. Try again. Dr. Brené describes the common theme through all three books is our yearning to live a wholehearted life! To show up and be seen even if it means risking failure, hurt, shame, and possibly even heartbreak certainly takes courage… but what is the alternative? Hiding out, pretending and armoring up against vulnerability kills our spirits, our hopes, our potential, our creativity, our ability to lead, our love, our faith and our joy. So what happens when we fall? What is going on in this moment? What do the men and women have in common that have staggered to their feet and found the courage to try again? Dr. Brené explores the process of rising strong and to slow down the falling and rising by bringing awareness to our choices we make during those moments of discomfort, and explore the consequences of our choices. I will be offering a new workshop based on this book and some other new ideas I am working on in order to provide you with unique experience that will allow you to rise strong and develop your own personal path to a wholehearted life. You can pre-order the book by clicking here. To get updates on the workshop schedule, sign up (and receive a free download: FREE E-Book “Letting Go to Create New Thinking Patterns”) in the right column of this blog post!